Either species should be obvious from the figures and descriptions given. 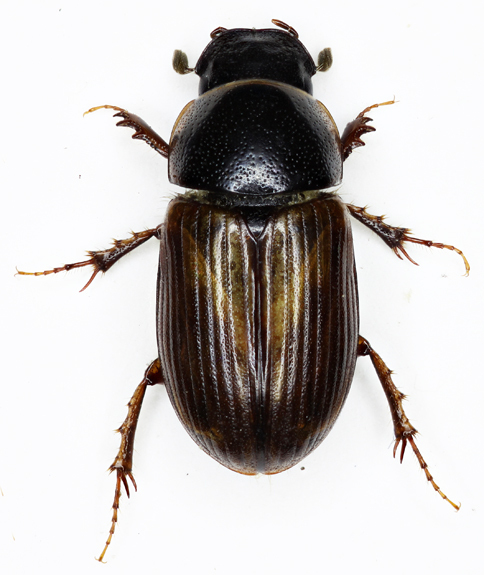 On the other hand having dealt with long series of these in the hope of finding other species it has become obvious that occasionally specimens vary to such an extent that doubt can be thrown into what should be a straightforward indentification. By long series we mean several hundred specimens crawling about in a sample tray under spotlights having been extracted from a sample of dung (see Techniques/Dung extraction). One of our members has been looking at such samples (usually 400 plus specimens, all or most of which are eventually released) on a weekly basis from the species' first appearance in 2007. Starting with obvious characters the following will isolate either species without any doubt. 1. Habitus. 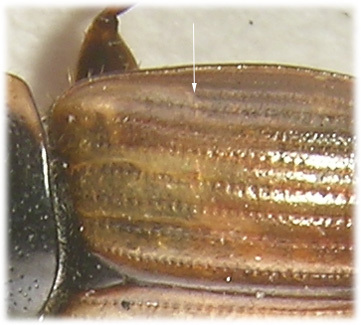 When seen together under strong light sphacelatus is generally smaller; shorter and distinctly narrower and the pronotum appears more metallic compared with the larger prodromus. Prodromus looks darker. Having separated by naked eye 200 or so live specimens into groups based on colour and size, and having mistaken only four (atypical) specimens, we are convinced that for field work when the two are found together this works well enough. 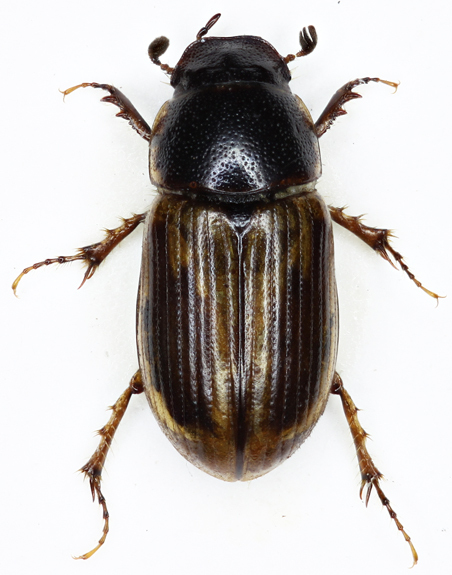 Prodromus/sphacelatus are distinctive and learned with a little practice; one of our members recognised a single Aphodius conspurcatus among a sample of over 450 prodromus/sphacelatus. 2. Pronotal Colour. Basal margin yellow in sphacelatus but sometimes extremely finely so. Black in prodromus but the yellow on hind angles sometimes (rarely) continues along the base for some way. 3. Elytral Colour. 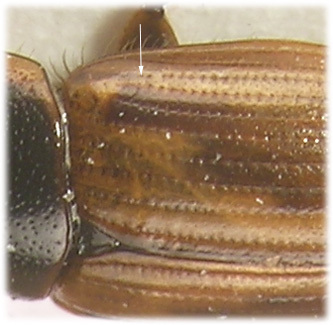 Small light specimens with distinctly patterned elytra are almost always sphacelatus. 1. Frontoclypeal Suture The frontoclypeus is the frons and clypeus which in Aphodius are fused, the suture is the join between the two and where visible is a line across the head between the eyes. If the suture is present then the specimen is sphacelatus. Sometimes though it is very fine indeed with the central part missing, here it needs to be looked for very carefully, viewing across the head in strong light helps. When viewing a very weak or interrupted suture and wondering whether you're seeing things or not, look at the eighth elytral stria which, in our opinion, even with the most ambiguous specimens, proves to be the most consistently reliable character. 2. Eighth Elytral Stria. 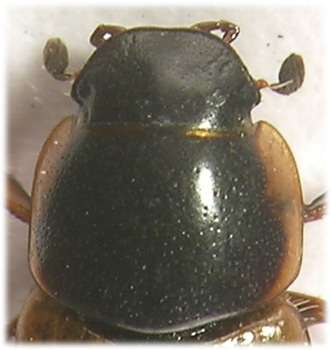 When this ends very abruptly at about double the length of the scutellum from the elytral base the specimen is prodromus. 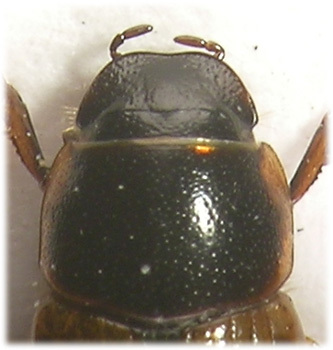 When the Eighth elytral stria continues uninterrupted until just beyond the line of the scutellum apex and then becomes a series of punctures (2,3 or 4) which continues to the base of the seventh, the species is sphacelatus. With a little practice this is a very easy character to appreciate and having looked at hundreds, we have no doubt that it is good. Of course it must be said that all the specimens we have seen are from around Watford, whether any regional variation exists we have no idea.